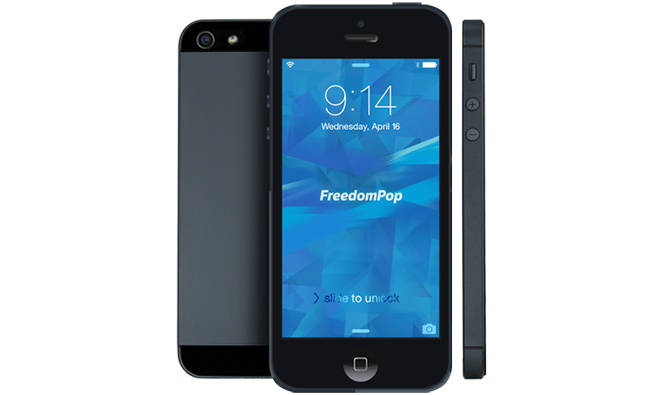 FreedomPop, which recently launched a cellular service to go along with its "free mobile data" plans, will be getting its first batch of Apple handsets with the iPhone 5 to sell as part of the firm's "freemium" service. According to Re/code, the mobile virtual network operator will be selling "like-new" refurbished iPhone 5 models for $349 to go along with its free VoIP plan, which includes 200 voice minutes, 500 text messages and 500MB of data per month. From there, add-on plans can be purchased starting at $5 per month. As FreedomPop runs on Sprint's network, new customers can also bring over compatible iPhone 4, 4S and 5 handsets to take advantage of the MVNO's low rates. Previously, the company only offered refurbished Android smartphones. "This is going to be a big step for us," said FreedomPop CEO Stephen Stokols. He went on to say that the iPhone 5 is a good fit for his company as it offers fast LTE speeds at a manageable price. The 4G tech is crucial as iPhone 5 owners will be using FreedomPop's voice over IP service for calling. Prior to its voice calling service that launched in October, FreedomPop started life in 2011 and rolled out cellular data provider, offering free or low-cost plans alongside mobile hotspots and other hardware. Finally, FreedomPop will also debut an app that offers free voice, text and voicemail for iPhone users on other carriers.